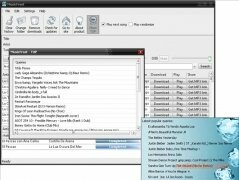 Music Frost is an application with which you will be able to search and download the songs that you like most. Furthermore, from the program you will be able to listen to the songs before downloading them. It is very easy to use and you will be able to search by author, title or album from a single search field. The first thing that you have to do is input the song that you are looking for in the search box. It doesn't matter if you don't know the exact name, because MusicFrost will show the results that most resemble the search. After that, you will see a list with the results. You will be able to listen to the song, download it or share it by means of a web link. Music Frost allows you to easily download MP3 files and it saves them in the folder that you indicate. 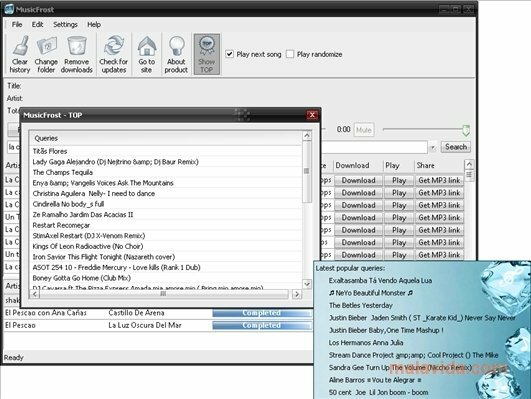 Furthermore, you will also be able to check which are the songs that are being downloaded. In what regards to the interface, you can customize it and choose different themes. If you like music, Music Frost will help you to discover new songs and find those that you were looking for.